How can I embrace where I come from? LEAGUE OF CANADIAN POETS: What inspired you to write your poem “Illusive”? 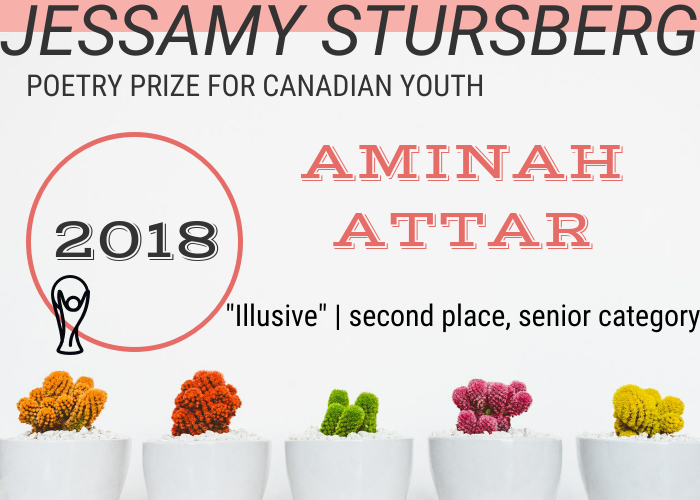 AMINAH ATTAR: Although, thankfully, I didn’t grow up around domestic abuse or violence I wanted to highlight the hereditary pattern of behaviors that transcend beyond the DNA. These behaviors do not have to be particularly prominent as they were in this case: a grandmother physically scarred by domestic violence. Of course as much as the granddaughter admired her grandmother she succumbed to the same silence. These behaviors can be little things where a child grows up constantly observing one parent belittling the other. As the child continues to grow up they are likely to understand that what the one parent did was wrong, but they are also likely to emulate those behaviors or fall into a relationship in which they are belittled. The cycle continues. There also tends to be inherent silence on topics regarding domestic problems. Whether it be for the preservation of the family unit, the preservation of one’s own dignity, or fear of what speaking up may lead to the silence often renders the problem itself immortal, seeping in some shape or form from one generation to the next. I hope that as we progress into the future that those reasons won’t stand. That victims will be able to see the need to break the family unit. That their dignities will be upheld through all the legal processes. Most importantly, that they won’t have to fear any sort of ramifications from themselves or society. LCP: How long have you been writing poetry? AA: I have been writing poetry ever since I was eight years old. It started with an obsession with Enid Blyton’s short stories series which ended up translating into a colorful poetry book about rainbows, goblins, and shoes. AA: Recently -as in the last few years- I have become quite involved in spoken word poetry. It is a type of poetry that focuses on the oral presentation as well as the words themselves and it is absolutely beautiful. The words become more powerful. If said with enough conviction the lines can embed themselves into the listener, inspiring various amounts of emotion. And I love that. I definitely see poetry playing a large part in my life over the next several years. Writing, however, is another story. I have a strong habit of starting the first paragraph and then leaving it just there. I have several pieces lying around that are all ‘could have beens.’ I will probably continue that and hopefully return to all the pieces that could have been great novels, political analyses, and screenplays one day.